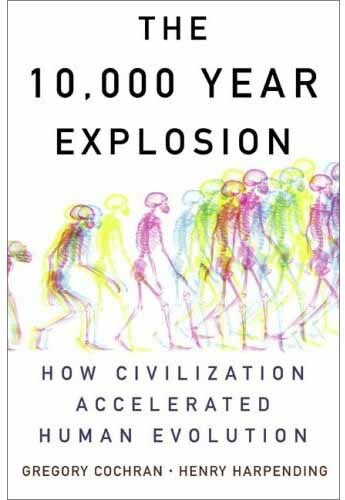 On Monday we talked about the fact that human evolution didn't -- as we were once told -- come to a screeching halt 40,000 years ago. Yesterday's topic was culture and its impact on evolution.Today we discuss Cochran and Harpending's contention that not only has human evolution continued during the last 10,000 years, it has sped up considerably. 2Blowhards: What are the main reasons you think that human evolution has accelerated over the last 10,000 years? Gregory Cochran: Theory and evidence. Theory says that humans would be less fitted to a new way of life, and that genetic changes that made the fit better would spread. It also says a greatly increased population would result in more of the rare mutations that cause such favored changes. We have lots of evidence of recent change, evidence of several kinds. We find unshuffled regions of the genome that have apparently increased in frequency recently (over the past few thousand years). We're just starting to look at ancient DNA, the genes of people who died thousands of years ago, and we see differences from the present. Of course we can look at their bones as well, and they look different -- human skulls have changed quite noticeably in the last 10,000 years, more among some groups than others. Along that line, we know of many other differences in phenotypes (bodies) that we don't yet understand the genetic underpinnings of. We know quite a bit about measureable differences involving disease between existing human populations: susceptibility to infections, diabetes and alcoholism: there is reason to think that these originated recently. In a number of cases, we know that risk alleles are ancestral alleles, the version of the gene everyone once had (and some still do). Populations vary in color-blindness, in the fraction of working olfactory genes, in visual acuity, in susceptibility to myopia. They vary in brain size by more than a standard deviation (from smallest to largest). And of course IQ scores vary by more than that. 2B: How certain a thing is it that human evolution is speeding up? Is it a settled fact? GC: Cranial capacity has shrunk 10% in 15,000 years: that's the fastest rate of change ever seen in the human fossil record, by far. Consider the number of genetic differences between humans and chimpanzees: they occurred over about six million years, from which you can determine the average rate or change. The number of genes that are apparently being replaced by new versions is much larger than you would expect from that long-term rate -- something like 100 times larger. 2B: What are your favorite examples of that evidence? GC: I tend to talk about the most strongly selected mutation that we more-or-less understand. That's lactose tolerance. On the other hand, some of the light-skin mutations (like SLC24A5) have probably increased even more rapidly and therefore must also have had strong advantages, probably stronger than lactose tolerance. 2B: Are these adaptationsjust surface-y, appearance-y things? Or are some of the adaptations situated deeper in the organism? GC: I mentioned SLC24A5. It's expressed most strongly in skin, but the gene is in every cell of the body and is expressed strongly in the thymus, the brain, lungs, and liver. It's possible that the advantage (or part of it) arises from something happening in one of those other organs. We don't yet know. Known changes are not limited to appearance. Going from the genes up, we know of many changes involving metabolism and digestion, immune defenses, DNA repair, sense of hearing and smell, brain, etc. Not that I would wish it on anyone, but ainhum intrigues me, since we’re talking differences. In that syndrome, which is moderately common among people of sub-Saharan African descent (~2 % of Nigerians), your little toes fall off for unknown reasons. This happens in Chicago as well. And of course you can determine race just by looking at the skull, virtually every time. The differences go to the bone. 2B: How likely is it that these adaptations would have an effect on how people perceive and experience life? GC: There are changes in neurological and sensory genes, but I can't say that we know much about the effects yet, except in a few cases. Color blindness is far more common among long-civilized peoples than among hunters (~8% in European males, ~1% in Pygmies) and I guess we can imagine what that does. We don't have much detailed, down-to-the-gene understanding, but we know plenty of differences whose genetic causes are not yet understood. We know that American Indians are on average laconic: I'd guess that is an innate tendency, but I don't know yet. Nisbett has talked about different cognitive styles between East and West, although he insists that they can't be biological. Of course they could be, and they may be. 2B: Who in the way of knowledgeable scientists would object to or take issue with your contentions so far as this goes? On what basis? GC: Well, you can get some similar genetic patterns by chance in very small populations, and some are arguing that what looks like selection is simply the result of the entire human race dancing on the edge of extinction for tens of thousands of years or more: until recorded history. For that matter, I've heard people argue that we don't really know that the effective population size of, say, Ancient Egypt was more than a few thousand -- a few thousand extremely hard-working pyramid-builders. This approach dismisses everything we have ever learned from archeology and paleontology. Some versions discard written history as well. One version, published in Nature, posited a population bottleneck for the ancestors of contemporary Europeans that lasted for four times longer than modern humans have even been in Europe (or outside of Africa). Of course, we see lots of phenotypic differences that look functional: skin color versus latitude, lactose tolerance in cattle-raising populations, hemoglobin mutations in the malaria belt, stubby bodies in the Arctic and lanky ones in East Africa. Chance-generated changes would not in general be useful. And we know that genetic variability is lower than average in the gene-rich parts of the genome, a mark of recent selection. Chance would hit all parts of the genome equally. 2B: What needs to be explained to nail down the human-evolution-is-accelerating hypothesis once and for all? GC: Probably the simplest method is simply to sequence dead people from various points in the past and directly see how much human genomes have changed. That has just begun. In addition, we need lots of work on what exactly the new variants do. 2B: Why is it important to look into this? GC: There should be a lot of genetic clues about human health. Also, it's entirely possibly that particular populations have came up with new variants that do something positive and unique, something the rest of the world does not have. We might be able to mimic such effects pharmaceutically. Or, someday, using gene therapy. Someday might be fairly soon, since I understand that lots of wannabee Olympic gold medalists are going to volunteer as lab rats. 2B: You and Henry write that human evolution may be proceeding as much as 100 times as fast as it once did. How do you arrive at that figure? GC: Theory predicts something like this, just from the degree of population expansion (roughly 100-fold) and the newness of the environmental challenges. And we get a similar estimate from comparing recent estimates of selection with the long-term rate determined from the differences between humans and chimpanzees. 2B: Are all population groups evolving in the same direction? GC: Sometimes more or less yes, often no. It depends on which trait you look at. Apparently all populations have developed lighter skeletons over the past 10,000 years, although there is reason to think that they haven't done so in exactly the same ways -- different mutations are involved. Obviously some populations have developed lighter skins while others have not. But there’s a lot we don’t understand. People working on a male birth control pill found that one version of the pill worked in 99% of Chinese subjects, but only 75% of European men. That means that there are differences in reproductive physiology –- I have no idea why. 2B: Are all population groups evolving at the same rate? Is it possible that some population groups are evolving lickety-split, where others are fairly static evolution-wise? GC: If we're right about big populations under agriculture changing rapidly, hunter-gatherers must have changed less. It would seem that Chinese probably changed a good deal faster than Australian Aborigines. 2B: Will human evolution keep accelerating? Or have we maxed out in terms of rate-of-evolution? GC: I think we're about to start cheating -– genetic engineering -- so it's hard to see where things go next. Please leave comments and questions -- Greg will respond to a selection of them on Friday. And please return tomorrow for Part Four. "Cranial capacity has shrunk 10% in 15,000 years": I have often wondered if hunter-gatherers needed to be cleverer than wheat-growers. If your small band is unlikely to thrive without at least one adult male of IQ, say, 115 (pure speculation), then you'd need a higher average IG (or higher standard deviation) to achieve that with high probability. Of course, that would be some IQ-like measure suited to their way of life, which might or might not be much like our paper-and-pencil tests to establish wheher you're suited to an abstract education. Sod it! "IG" -> IQ. In that syndrome, which is moderately common among people of sub-Saharan African descent (~2 % of Nigerians), your little toes fall off for unknown reasons. This happens in Chicago as well. Is the Chicago part a joke? One of the types of genetic change that (I understand) you describe in the book confers a benefit in the heterozygotic state (one copy of the gene has the mutation, the other has the ancestral form). In the homozygous state (both copies have the mutation), such a gene has severe deleterious effects. The classic example is the sickle-cell trait: a carrier having only one copy gets some resistance to malaria, but a person having two copies suffers from sickle-cell anemia. I believe that you make the case that the two genes suspected of having a large effect in boosting the IQ of some Ashkenazi Jews have analogous selective advantage and disadvantage. It would seem possible that some mutations to some genes could confer benefit in the heterozygous state (1 mutant copy + 1 ancestral copy), but be extremely deleterious in the homozygous state (2 mutant copies) -- so much so that homozygous fetuses would suffer spontaneous miscarriages during, say, the first trimester. Alleles of such genes would have very distinctive distributions in a population, i.e. they would be very far from the Hardy-Weinberg equilibrium. Is it plausible that recent human evolution has led to the spread of alleles that confer some selective advantage in such an extreme fashion? If so, would they have been likely to have been identified already, in the course of family studies and genome wide association studies? Or is this sort of landscape still largely unexplored? "Is the Chicago part a joke?" "Recently, Daccarett, et al reviewed 4126 consecutive radiographic studies of feet performed in the African American population of Chicago. After an initial screening based on the Cole criteria for ainhum, 581 patients were selected and reexamined with enhanced visualization techniques for soft tissue. After review of the complementary examinations, 102 patients (1.7%) were diagnosed as having ainhum." "I have often wondered if hunter-gatherers needed to be cleverer than wheat-growers." Jared Diamond has similar thoughts in Guns, Germs, and Steel, mostly based on his experiences in New Guinea. From the interview: "Chance would hit all parts of the genome equally." Somewhere in Las Vegas, a casino owner is smiling. Chance doesn't appear to work that way. Nassim Taleb's The Black Swan immediately comes to mind. Nisbett has talked about different cognitive styles between East and West, although he insists that they can't be biological. Of course they could be, and they may be. Of course, this is only one example that doesn't say much by itself, but it's quite representative of the general state of research in these controversial areas. When one analyzes the factual basis for the spectacular claims from interviews and book blurbs, it turns out that they're based on whole layers of unwarranted assumptions, invalid inferences, and cherry-picked data in the service of reaching the desired conclusions. Here I'm not targeting any particular authors, books, or ideological camps. Such flaws are omnipresent in the whole spectrum of positions on these issues that I've seen argued in the literature, especially the more extreme ones. This is not surprising, considering that most of the authors that take positions on the extremes are engaged ideologically outside their research work (including, if I'm not mistaken, at least one of the authors of this book). Unfortunately, it also means that for a non-expert, it's basically impossible to form an informed opinion relatively free of bias. AMac asks about loci where the mutant homozygote is lost so early it is never seen. Two that fit that pattern are the common BRCA1 mutation that elevates breast cancer risk and Melanesian Ovlocytosis, a malaria polymorphism. No one has ever found a homozygote of either mutant: they must be lost very early in pregnancy.